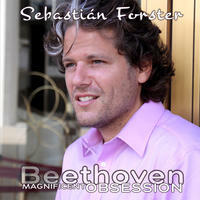 Sebastian Forster : Magnificent Obsession vol 8 - Beethoven Sonatas. Exquisitely performed beethoven piano sonatas. Worldwide acclaimed pianist Sebastián Forster ventured into accomplishing a lifetime-legacy major project of immense proportions: the recording of the 32 Piano Sonatas of Ludwig van Beethoven, in an ongoing creative effort during 10 albums, from 2009 to early 2012. Sebastián is a true Beethovenian, he breathes and experiences Beethoven's every single emotion, of true love, drama, passion, desperation, beauty and darkness. Living Beethoven with every key stroke is an experience of monumental inner impact, only at reach for the daring soul and the truly talented soloist. Famous for his deeply moving and highly original interpretations and dazzling mastery of his repertoire, Sebastián continues this travel through the universe of Beethoven in this Volume 8 with three Sonatas from 1814 and 1816. Ludwig van Beethoven's Piano Sonata No. 27 in E minor, Op. 90 was written in the summer of 1814 - Beethoven's late Middle period - and was dedicated to Count Moritz von Lichnowsky. Unlike a typical sonata, this piece consists of two highly contrasting movements. Ludwig van Beethoven's Piano Sonata No. 28 in A major, Op. 101, was written in 1816 and was dedicated to the pianist Baroness Dorothea Ertmann. This piano sonata runs for about 20 minutes and consists of four movements. Ludwig van Beethoven's Piano Sonata No. 29 in B-flat major, Op. 106 (known as the Große Sonate für das Hammerklavier, or more simply as the Hammerklavier) is a piano sonata widely considered to be one of the most important works of the composer's third period and among the greatest piano sonatas. It is also widely considered to be Beethoven's single most challenging composition for the piano, and it remains one of the most challenging solo works in the classical piano repertoire. Hear Beethoven as you have never heard it before, getting lost in the world of invigorating ideas and emotional virtuosity that has made Sebastián Forster one of the outstanding interpreters of the classical repertoire currently working on the world stage today. License Exquisitely performed beethoven piano sonatas by Sebastian Forster for your project. Play the music of Sebastian Forster in your restaurant or store.